Yesterday on Coffee Break with Game Changers, Bonnie D. Graham hosted a show focused on designing the future of humanity. You can listen to the rebroadcast here. The session abstract is included below. The show participants included: Bonnie, Masha Krol, Ian Gertler, Maricel Cabahug and myself. With all the talk of AI and its potential negative impact on humanity, we lose sight of the positive. As an engine for augmentation, artificial intelligence is likely to advance our human potential. The effectiveness of what we do stands to improve – whether its creativity and design, or oriented in analytics. Some would prefer to call it “Augmented Intelligence” versus artificial intelligence. If we view the progression of AI on a spectrum, we could indeed reach the place of augmentation and never approach the other end of the spectrum. This lies at the heart of the artificial intelligence debate. In a recent book titled, Robot-Proof: Higher Education in the Age of Artificial Intelligence, Northeastern University president Joseph Aoun proposes a way to educate the next generation of college students, supporting society in ways that artificial intelligence cannot. His underlying premise is that the existing model of higher education has yet to adapt to the seismic shifts rattling the foundations of the global economy – I firmly agree. It was Alvin Tofler that said: The illiterate of the 21st century will not be those that can’t read or write, but those who cannot learn, unlearn, and relearn. This conversation is broader than a focus on school-aged young adults. What Tofler pronounced applies to all of us. In his book, Mr. Aoun presents a new model of learning that enables us to understand the highly technological world around us, allowing us to transcend it by nurturing the mental and intellectual qualities that are unique to humans – namely, their capacity for creativity and mental flexibility. He calls this model Humanics. These Human Traits represent our future skills profile, including many of the right brain characteristics visualized below. We will want explorers, problem solvers, dot connectors, continuous learners, and those not afraid to challenge the status quo. Is Creativity the Sole Domain of Humans? The transition from our current industrial/information age to an augmented and then ultimately an automated society is underway. 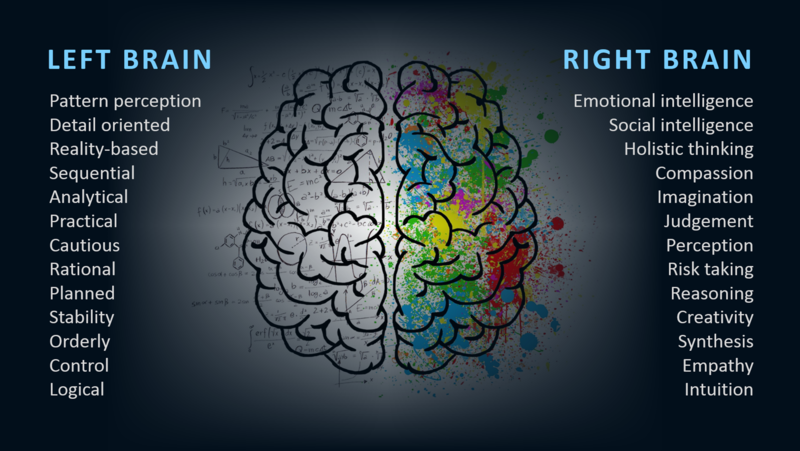 The role of humans in that society is an often discussed topic, where our right brain characteristics are likely to play a more dominant role. But are those characteristics the sole domain of humans? Meet an Artificial Intelligence Virtual Artist called AIVA that was taught to compose classical music – an emotional art which is usually considered to be a uniquely human quality. Musical pieces composed by this AI are used as soundtracks for film directors, advertising agencies, and even game studios. Oh, and it released its first album called Genesis. Our exponential world puts increasing pressure on our capacity to innovate and the speed and quality of idea flow. This dynamic coupled with the speed at which automation is likely to occur brings our right brain characteristics front and center. Creativity, imagination, big picture vision, emotional and social intelligence, empathy, and other human characteristics are critical to navigating in this emerging future. As automation accelerates, these human traits become even more critical. In a recent report by Citi on Technology at Work, the authors point to our propensity for social interaction, communication, and empathy being something machines can never replace. The future is arriving faster than most people think. I invite you to rehearse along with me – enjoy this journey through the looking glass. Expand the window below to view via PowerPoint online. When we look around us, we see a world in which digital is now woven into the fabric of our lives. Where convergence of paradigm shifts is now the new norm and the pace of change is accelerating exponentially. We are now living in a looking-glass world; where everything we think we know is being challenged, including our long-held notions of success and failure. At the same time it’s a world where we can imagine, create and enable like never before.